All of the above categories of credit card rates remained unchanged for the second consecutive bi-weekly survey. These stable credit card rates can be viewed as the calm in the eye of a storm, as conflicting economic currents swirled around them without impacting them. On September 13th, the Federal Reserve announced that it was expanding its program of quantitative easing, which is an effort to drive interest rates down in an attempt to stimulate the economy. In the two weeks since, there has been no reaction yet from credit card rates, perhaps because credit card companies were digesting a conflicting signal from inflation at the same time. The day after the Federal Reserve announcement, the Bureau of Labor Statistics announced that inflation increased to 0.6 percent during August, the largest outburst of inflation this year and the type of development that would often send interest rates higher. Of course, in addition to these conflicting signals, another form of uncertainty hangs over the economy in the form of the Presidential election. Until these uncertainties resolve themselves, wait-and-see may be the default policy of credit card companies. With no change in either category of consumer credit card offers, the spread between rewards and non-rewards rates remained at 2.49 percent. The size of this spread is the potential price consumers pay for rewards programs. Therefore, in deciding between non-rewards and rewards credit cards, consumers need to factor in both the economic benefit they would realize from those rewards, and the additional interest cost they would incur if they carry over credit card balances at the end of the billing cycle. 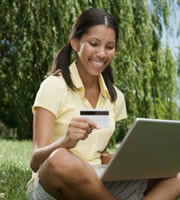 The average student credit card rate remained unchanged at 17.34 percent. On the whole, student credit card rates tend to be higher than other categories of rates, because students are just beginning to establish a credit history. This difference in rates underscores the importance of developing good credit habits from an early age, so as to be able to move into lower-rate credit cards over time. With no change in rates for business credit cards, the spread between business rewards and non-rewards rates remained at exactly 1 percent. This is tighter than the spread between consumer rewards and non-rewards rates, suggesting that the business market as a whole puts less value on rewards programs. That could be an opportunity for businesses to exploit, if they either tout rewards as an executive perk or have a systematic program to harvest rewards benefits on behalf of the company. In particular, this makes sense for a business that routinely pays its bills on time (thus incurring no interest charges) because they can capture this benefit without cost. With no change in the credit card offers surveyed, the difference between rates offered to customers with excellent credit and the overall average for consumer rates remained at 3.83 percent. This spread can be an indicator of the economic outlook. If the spread widens, it indicates that credit concerns are growing, which generally means a worsening outlook for the economy. If that spread becomes narrower, it generally indicates the outlook for the economy is becoming more optimistic. The fact that this spread has remained stable for the last month and a half is consistent with the wait-and-see attitude that credit card companies, like many businesses and consumers, are taking towards the economy. 0 Responses to "Calm credit card offers in the eye of a storm"